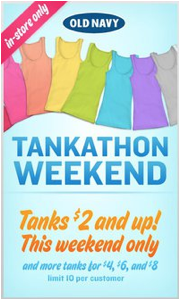 Old Navy Tankathon Weekend – $2 Tanks! Head over to Old Navy this weekend for the Tankathon to get your $2 tanks! This event starts Saturday, 6/25 at 9am and ends Sunday,6/26 at 9pm! There is a limit of 10 per customer!